Parents & Family Weekend will be November 4-6. Registration takes place September 21-30. For those of you planning your first Parents & Family Weekend experience, here are a few insider tips to making the most of your weekend. 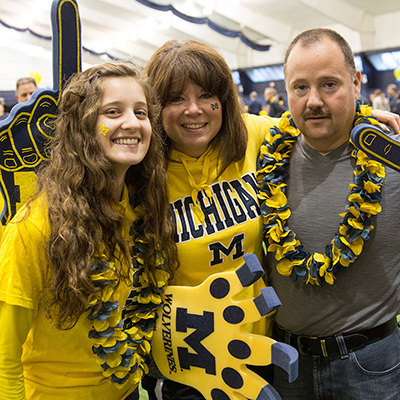 First, keep in mind that Parents & Family Weekend is your chance to experience all that the University of Michigan has to offer. There are events and activiites that require registration through the Parents and Family online registration form and other events taking place over the weekend, that may not be advertised in the Parents & Family Weekend program. Ann Arbor offers countless activities every day, so there is sure to be something of interest for your family. There will also be a posting board at the Michigan Union Anderson Room on Friday 10 a.m. - 7 p.m. where parents looking to buy or sell tickets can post their information. If you’re interested in tickets, be sure to stop by the posting board late in the day – you might just find exactly what you're looking for (and sometimes at bargain prices)! Second, make your hotel reservations as soon as possible, because hotels book up quickly on home football game weekends. However, carefully read those cancellation policies. You will find that hotels are expensive on game weekends, and they typically have more restrictive cancellation policies than normal. If you need more flexibility with your hotel, look outside the Ann Arbor area. The smaller towns in Washtenaw County or hotels near Detroit Metro Airport are not as tied to the home football calendar and may keep their normal policies (and prices) in effect. Finally, relax and enjoy your visit, focused on the best part -- spending time with your student. You may have limited time together, because your student may be busy attending class and doing schoolwork, so treasure every minute. And to make the most of your weekend, plan to spend some time in Ann Arbor on your own, exploring the city (and mastering parking), taking advantage of all that Ann Arbor offers, and enjoying the amazing transformation of your student into an adult.